Heat oven to 425°- roll out pastry and cut into about 7" squares. Pare and core one apple for each dumpling. Place apple in center of each square. Mix together the Pure NYS Granulated Maple Sugar and Cinnamon - fill apple cavities. Dot each apple top with about 1/2 teaspoon Butter. Bring opposite points of pastry up over the apple. Moisten pastry to seal it together. Place in baking dish. Bake 40 to 45 minutes until crust is nicely browned and apples are cooked through (test with fork.) Put dumpling on hot serving dish. Drizzle with hot maple syrup and top with whipped cream or ice cream. Snicker doodle Cookies are my sons favorites. They are one cookie that I love to bake in the fall. The scent of cinnamon sugar baking in the oven leaves an aroma in the air that is delicious. Bake up some delicious snicker doodle cookies Enjoy!! Re-Play recycled HDPE (milk gallon) products are manufactured, assembled, packaged and tested in the USA. Operating primarily in the south eastern part of the USA Re-play are striving to reduce greenhouse gases and saving energy by having the recycling, molding and warehouse all within reach of each other. Their goal is to help take care of the earth that we live on. Re-play products are made from recycled HDPE which is #2 plastic and BPA free, phthalate free, and PVC free. Its better for your child and easy to take care of as well as Re-play products are dishwasher safe. However they are not microwave safe. The colors have been FDA approved and are safe. watt bulb for 11 hours. The dishware set is perfect for little hands learning how to feed themselves. To start with the spoon has a deep scoop to help get food into the spoon without losing it. The fork is made with rounded tips to ensure your child's safety. The plate has deep walls that are perfect for the little ones to scoop up food in order to eat. The wells of the plate are deep enough to hold the food without it falling off easily. The plate is also sectioned so that each area has a bit of room and you can encourage your child to enjoy more foods. The bowl is created for a variety of foods from snacks, soups and cereal. Each of them easy to eat with the bowl having enough depth to hold whatever it is. Drinking cups offer the perfect size for toddler hands and thirst. The fact that they are stackable makes cleanup even easier. The spill proof cup has a one piece easy clean silicone valve. This makes the cup easy to travel with your toddler. It's been a while since we have hosted a giveaway on our blog annies home. A fine sponsor one that has been here before , recently in fact with a review of their delicious sugar free brownies. Fairytale brownies is sponsoring a giveaway where one lucky winner will receive a delicious package of brownies and magic morsels to share or keep for themselves. Its fall and that means that there will be pumpkin spice every where. I simply love the flavor and scent of pumpkin. Don't worry you can get your brownie in the flavor of pumpkin spice as well. 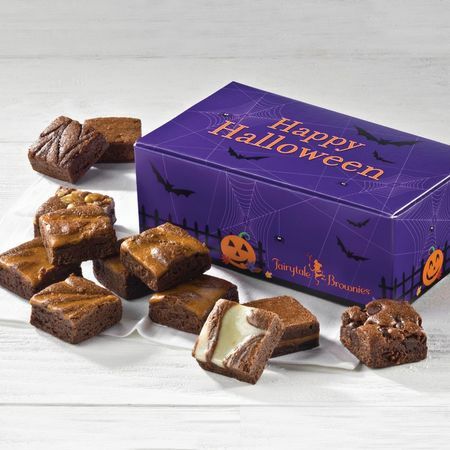 Special for the holiday season and just in time to wish you and yours a Happy Halloween comes the pumpkin spice fairytale brownie collection. In fact up for grabs in this giveaway is a 6 pack of the delicious pumpkin spice magic morsels and 1 each of caramel, chocolate chip, original, raspberry swirl, walnut and cream cheese magic morsels. Magic morsels are bite sized brownies perfect for snacks or take along to share with friends.